NLCB Buccooneers in the Medium Band finals last year. 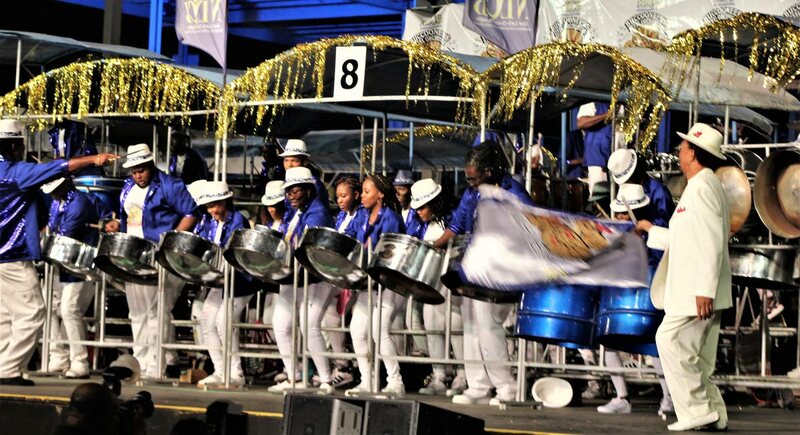 IN a time of financial uncertainty where players are not receiving stipends and prize money is long in coming, one Tobago steel orchestra has taken a leap of faith. After campaigning in the Medium category for about 15 years and having won once along with several seconds, thirds and fourth places NLCB Buccooneers has moved into the realm of the large bands. Captain Anthony Hopkins said, “This is something that has been in the air for sometime and because of the rule which allows one arranger to one band in each category we just could not do it. “This year a window opened and the opportunity came along and we decided to make the move we always wanted to make.” Asked about players, Hopkins said, “It might be a little challenge, nothing we can’t handle. I feel we can convince players to come with us. We are looking at the minimum 40 to 100 players. As a medium band we had the maximum (90). When it comes to the instruments we can also handle that as there is not much needed. “We are not worried as we are confident in the music we put out and our sponsors are on board with us. NLCB has taken a load off our shoulders as we have been going for years without that kind of help and did fairly well,” Hopkins said. The confident Hopkins says he does not see it as a big move but as a simple transition while arranger Seion Gomez appreciates the move. Reply to "Buccooneers grows into large band"